The 6th San Diego Jewish Food Festival will be held Sunday May 7th 2017. We are looking for a one-of-a-kind design to serve as Festival's graphic focal point for printed posters, cards and digital media for the Festival. All artists are invited to submit their original graphic designs for consideration. The winning design will be the identity centerpiece of the promotional campaign for the 2017 San Diego Jewish Food Festival. The design will be used as the official festival poster, and will also be the basis for media advertising that may include newspaper, magazine, social media, Festival program and more! The artist creating the winning original poster selected by the 2017 JFF Art Committee will be awarded $100 for their design. In addition, the top three artists will receive JFF Family Fun Gift Packs to enjoy the entire day at the 6th Annual San Diego Jewish Food Festival on Sunday May 7th 2017. Deadline for Submission of Poster Design Entries: December 18, 2016. 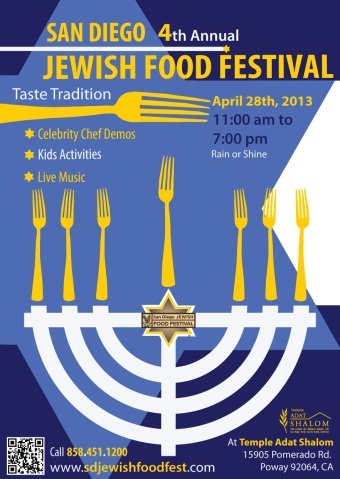 All contest design entries should be submitted to: San Diego Jewish Food Festival Poster Contest, 15905 Pomerado Road, Poway, CA 92064. Please see below for poster design guidelines and the official entry form. Global Jewish culinary culture and cuisine. The character of kosher cuisine. The wondrous aromas, sights and melodies found in the Jewish kitchen. Temple Adat Shalom in Poway, the center of Reform Judaism in North County Inland. The official JFF logo (see above) must be incorporated into the poster design. Temple Adat Shalom logo must be incorporated into the poster design. Digital files of both logos to be provided upon entry registration. Entry form must be completed first. All original art entries must be submitted as digital files with a small color print. - Resolution must be 300 dpi. - Image size must be set so the longest dimension is 1200 pixels. - Name your image file as follows: first five letters of your last name, JFF2017, .jpg extension. The top 10 designers will be asked to submit a full-scale, dry-mounted print. Artwork must be original and not copied. If your design wins, you must submit an editable scalable native working file, including all fonts used in the design.